Samabe guarantee you will always get better value, better rates and better stay when you reserve one of our luxury Suites or Villa through the website and that you will not find a lower rate anywhere else. If you do then we will match the rate and also add an extra 10% discount for the same type of accommodation. "There is always a tale behind my food" said Tashia Yunasz, Executive Chef of Samabe Bali Suites & Villas. Here, she shares about the story behind Symphony of Indonesia, a new dish listed on the dessert menu. It is not only a tasting platter. It has a secret behind it. 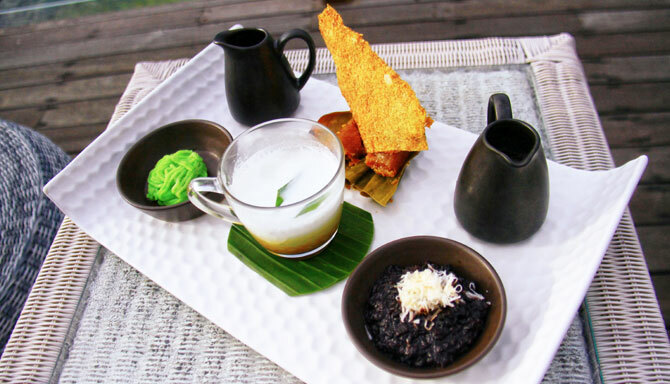 Symphony of Indonesia combines 7 kinds of traditional Indonesian dessert with distinct textures "It is like a symphony; It is made up of different sections, but they create a harmony", Tashia explained. This traditional dessert is a remembrance of Tashia's childhood food. She grew up in Jakarta, and those sweet foods are known among Betawi people. Some of them such as "kembang goyang" are not widely produced like what she remembered. So, Tashia decided to use the chance of preparing the new dessert menu for recalling her childhood memories as well as sharing what she loves with Samabe friends and families.